The HXY-6A spindle type core drilling rig is driven by hydraulic pressure with powerful drilling force. It can perform diamond-bit small-diameter core drill. It has a compact structure, a rational layout and a moderate weight. It has large range of rotary speed and strong hoisting force. It is equipped with water brake and thus is easy to lift in low position. It is easy to assemble. The HXY-6A spindle type core drilling rig is widely used for exploration of metal or non-metal solid mineral ore bed. It is applied in field of geology, metallurgy, coal mine, hydrological and engineering drilling. It can also be used in the exploit of superficial-zone petroleum and natural gas, mines' ventilation and water discharge for tunnel drilling. Besides, the drilling rig is suitable for Large-diameter foundation pile drilling. When applied in engineering works, it can be used to drill both inclined and vertical hole. 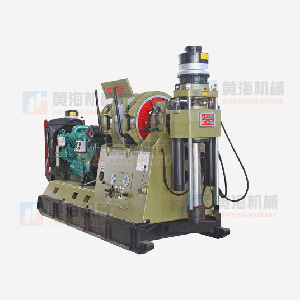 HXY-6BⅡCore Drilling RigThe HXY-6B core drilling rig is driven by hydraulic pressure. It has large range of rotary speed and great hoisting force. It is equipped with water brake. It is convenient in low-position lift.